The Lotus 78 wing car was a Formula One racing car used in the 1977 and 1978 seasons. It was designed by Peter Wright, Colin Chapman, Martin Ogilvie and Tony Rudd, after he had studied a de Havilland Mosquito fighter bomber, he paid close attention to its wing mounted radiators, and the hot air outlets that were designed to induce lift. Chapman realised that such a system inverted could give significant downforce, Rudd appointed a team to work on the project, chief designer Ralph Bellamy, vehicle engineer Martin Ogilvie and aerodynamicist Peter Wright. Rudd and Wright had previously worked for BRM, and before joining Lotus in 1970 had done a study into the possibility of an inverted wing profile fitted to one of their cars. 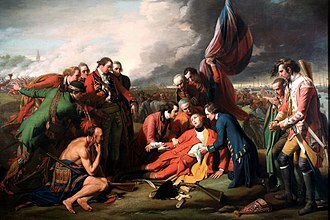 Rudd had tested a number of models, but lack of the right testing methods. 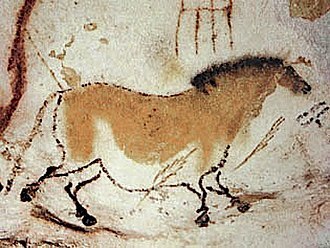 However, Wright remembered their work and brought it into the project, Wright set about experimenting with F1 car body shapes using a wind tunnel and a rolling road, when by happy accident he began to get remarkable results in one of the models. Closer inspection found that as the roads speed increased, the shaped underbody was being drawn closer to the surface of the road. 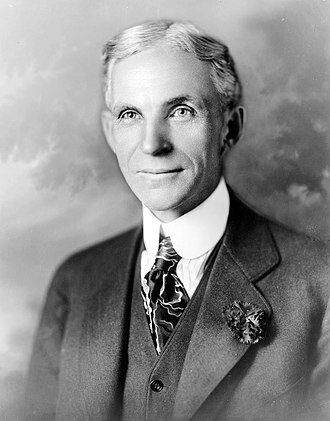 Wright experimented with pieces of cardboard attached to the side of the car body. 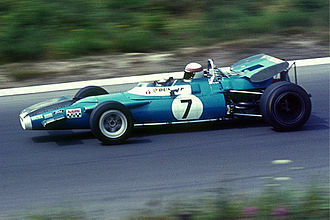 The results were presented to Colin Chapman, who gave the free rein to come up with an F1 chassis design. After a round of design sketches and engineering drawings, and further work in the tunnel at Imperial College the car was put into production. Five examples were built, codenamed John Player Special Mk, III, otherwise known as the Lotus 78 which appeared in July 1976. 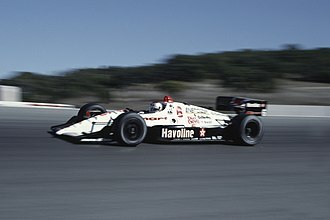 Mario Andretti wanted to introduce the car early, possibly at the Dutch Grand Prix that year but was overruled by Chapman, the 78 was introduced at the first race of 1977, and proved to be the class car of the field that season, winning five races. The 78 was loosely based on the Lotus 72, sharing the same basic shape and internal layout, but featuring detailed aerodynamic improvements, better weight distribution. 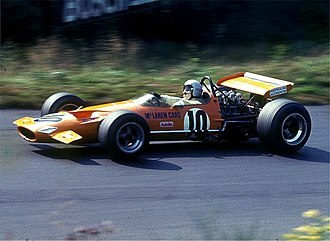 The McLaren M23 was a Formula One racing car designed by Gordon Coppuck, with input from John Barnard, and built by the McLaren team. 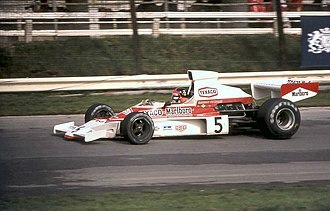 It was a development of the McLaren M16 Indianapolis 500 car, a Ford Cosworth DFV engine was used, which was prepared by specialist tuning company Nicholson-McLaren Engines. This helped push the DFVs horsepower output to around 490 bhp and it was introduced for the 1973 season, and scored pole position with Denny Hulme on its very first outing. Hulme and Peter Revson took three wins between them that season, while rookie Jody Scheckter nearly added a fourth. 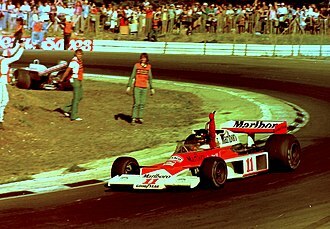 Scheckter was responsible for one of the biggest accidents Formula One has ever seen, at the 1973 British Grand Prix, emerson Fittipaldi joined McLaren from Lotus in 1974. 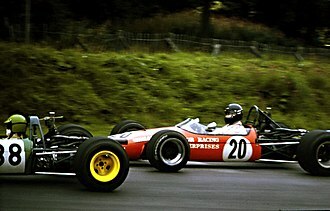 His knowledge of the Lotus 72 helped McLaren develop the M23, most of these changes were adopted for the M23 and its successor, the McLaren M26. 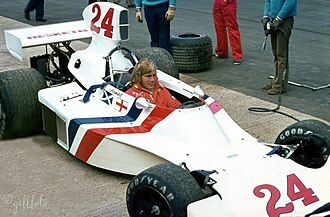 At the end of 1975 Fittipaldi left the team to join his brothers Copersucar-sponsored Fittipaldi Automotive team and he was replaced by James Hunt, who went on to win a dramatic and controversial 1976 season with the final evolution M23, the M23D. 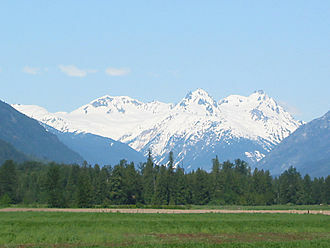 The 1978 Formula One season was the 32nd season of FIA Formula One motor racing. 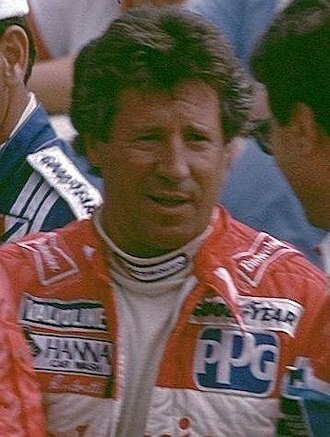 The season included the non-championship BRDC International Trophy, mario Andretti won the Drivers World Championship. He remains the last American driver to win the World Championship, Ronnie Peterson was awarded second place in the Drivers standings posthumously, having died from medical complications after an accident at Monza during the Italian Grand Prix. JPS-Lotus was awarded the International Cup for F1 Constructors, Championship defendants Niki Lauda and Ferrari had parted ways late in 1977 and both parties struggled to repeat the successes they had enjoyed the previous seasons. 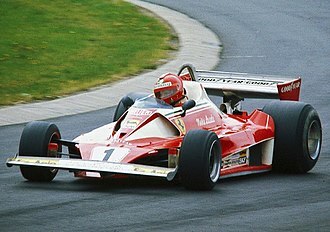 Carlos Reutemann finished third in the championship in the lead Ferrari, the following drivers and constructors contested the 1978 World Championship of F1 Drivers and the International Cup for F1 Constructors. 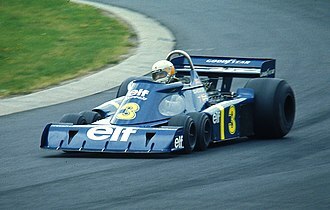 The 1978 World Championship of F1 Drivers and the International Cup for F1 Constructors were contested concurrently over a sixteen race series, the start was uneventful, with Andretti and Reutemann easily keeping first and second, with John Watson in the Brabham taking third from Peterson. Watson took second from Reutemann on the lap, but Andretti was uncatchable. 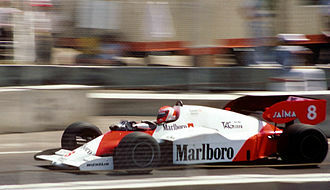 Andretti motored on to a victory, with Lauda second. 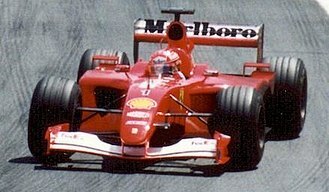 This had been an unusual Argentine Grand Prix- although the weather had been usually hot. 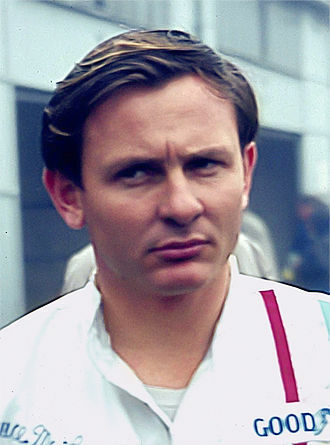 The typically extreme weather during January in Rio meant that this race was run in oppressively hot, Peterson took pole with James Hunt driving for McLaren beating Andretti to second. At the start, it was Reutemann who beat the trio into the first corner, with Hunt and Andretti following, Hunt ran second until he had to pit for tyres, as a result Andretti took the place until late in the race when he suffered gearbox issues. 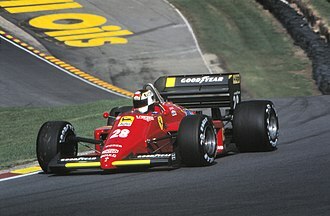 After a long break, the season resumed at the Kyalami circuit in South Africa, Andretti took the lead at the start, and set about building a gap, whereas Lauda dropped behind Jody Scheckters Wolf. 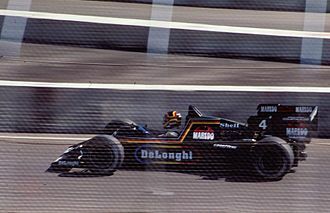 Young Italian Riccardo Patrese was on a charge in the Arrows, as the race went on, both Andretti and Scheckter began to suffer from tyre issues and were passed by Patrese. The DFV is an internal combustion engine that was originally produced by Cosworth for Formula One motor racing. 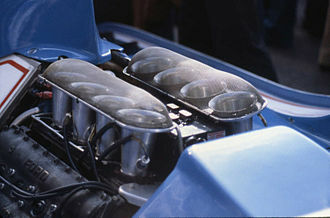 Named Four Valve because of the four valves per cylinder, and Double as it was a V8 development of the earlier, four-cylinder FVA and its development in 1967 for Colin Chapmans Team Lotus was sponsored by Ford. 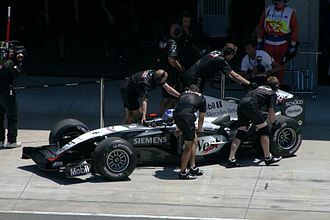 For many years it was the dominant engine in Formula One, and it was used in other categories, including CART, Formula 3000 and Sportscar racing. 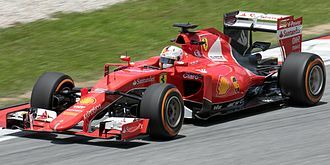 The engine was a 90°,2,993 cc V8, with bore & stroke of 85.67 x 64.897 mm producing over 400 bhp from the start, reaching over 500 bhp by the end of its Formula 1 career. The 1983 DFY variant had a bore and stroke of 90 x 59 mm giving 2,993 cc. 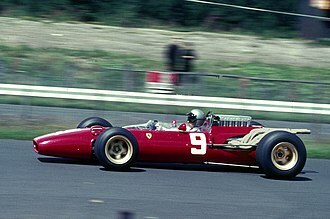 In 1965, the Fédération Internationale de lAutomobile, that administered Formula One racing, Chapman approached the Ford Motor Company and David Brown of Aston Martin for funding, each without initial success. 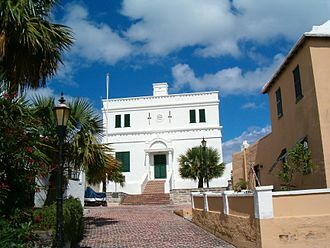 Chapman approached Ford of Britains public relations chief, former journalist Walter Hayes, since Hayes had joined Ford in 1962 the pair had previously collaborated in the production of the successful Lotus Cortina, introduced in 1963. 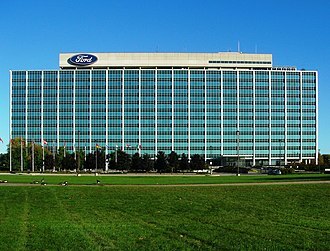 Hayes arranged dinner for Chapman with Ford employee Harley Copp, a British-based American engineer who had backed and engineered Fords successful entry into NASCAR in the 1950s, stage two would produce a V8 engine for Formula One, by May 1967. Team-mate Jim Clark moved up through the field in his identical car, this dominant performance belied a serious fault in the timing gear. 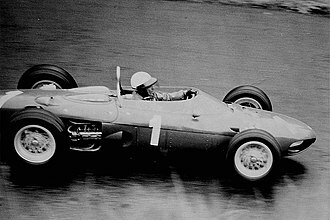 Clark took three wins that season, but reliability problems left him third in the Drivers Championship,10 points behind Champion Denny Hulme. 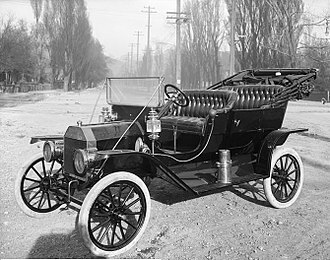 The progress of the engine was documented in a film produced by the Ford Motor Companys film section, entitled 9 Days in Summer. 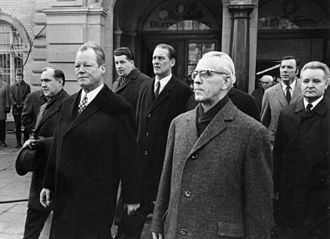 Initially, the agreement between Ford and Lotus was binding on all parties, and Ford as the funder had no plans to sell or hire the DFV to any other teams. Only Brabhams Repco V8 engine provided a combination of power and reliability. 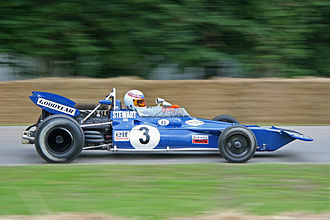 Hayes released the DFV initially to French team Matra, headed by Ken Tyrrell with Jackie Stewart as a driver. 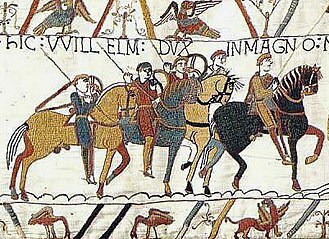 What followed was an age, where teams big or small could buy an engine which was competitive, compact, easy to work with.